Earth is a living library of creation and beauty of the universe. A cosmic library of frequency and how information is stored in the genetic process. Now, stars are very much like people, as you will begin to see. They're alive, and they have personalities and many qualities like we have. On a scientific level, they have growth stages. Are you ready to go inside and remember who you are? EARTH is the only planet in the universe that forgets their connection with God. And we have to stumble through life with blinders on until we discover it again. They must forget why they have come, and where they have come from. All that is left is a secret longing that there is something else that they can’t quite grasp. until light and memory begins to seep through the blinders. but it is not the only school. we have to go through a whole series of classes, each with its own series of lessons, gradually increasing in their difficulty and complexity. You can't proceed to the next “grade” until you complete the present one. If you fail the class or grade and don't learn the lesson, then you have to repeat that grade. You can't jump from kindergarten to college. The universe doesn't care how long it takes you (as an individual soul) to complete a lesson. You have all of eternity to work it out. But why would you want to take that long to progress, to learn one lesson? I would think you would want to graduate as soon as possible in order to return to God. Why get bogged down in the sticky glue of Earth, and be stuck in the same grade while others around you are progressing rapidly? Many other planets have easier courses of learning, but Earth is the most difficult. and only the bravest of souls sign on for assignment. air, gases, water, even simple cells, dirt, rocks. Everything has consciousness, Everything is alive, Everything is energy. in any type of school. Then you experience the plant and animal kingdom. There are valuable lessons to be learned from being a flower or an ear of corn, or from running like a wolf or flying like an eagle. We can understand this because we are all One,and we have all been these different forms of life in our early grades in Earth school. fairies, gnomes, leprechauns, dryads, etc. These have the job (or assignment) of taking care of nature. These beings are all very real, and we have all had lifetimes in these forms of existence. Nature is a different sort of spirit because it is considered a “group” spirit. a herd of cattle, a hive of bees or a colony of ants. They seem to work and think as a group mentality. you have to separate the soul from the group. This is done through love. If you take an animal into your home, or give it love and attention, you give it an individuality and personality, and help it separate from the group soul so it can begin progression through the human part of the school. When you become human you also have to be everything. Progressing from the most primitive human form upward to the most intelligent, you have to know what it is like to be everything. You have to live on every continent in the world & be every race & religion before you complete the school. You have to experience both sides of every possible situation. You have to understand all of these ways of living, existing and thinking. 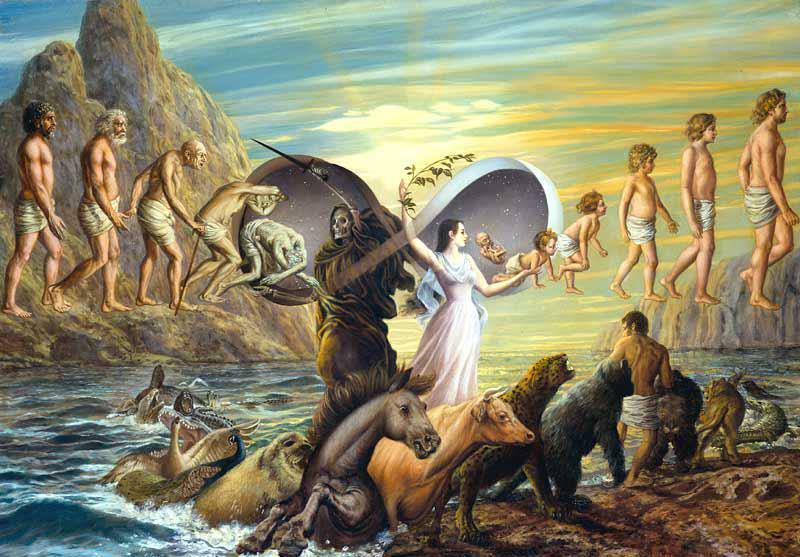 The main concept behind reincarnation is learning not to judge or have prejudice. We are all here in the same school at different stages of development. you understand the connectedness of all life. The fact that everything is alive, and everything is one. it carries this understanding at a soul level. Our problem now in our world, is to bring these memories back to the conscious level. So we can start honoring our Earth again as a living being. You have lived on other planets and in other dimensions. You have done many, many things you cannot even imagine. The human side of the mind is sort of fighting with the nonhuman side of the mind. One wants to relax and let everything be, and the other one is just completely confused...too much going on. It’s like being two people in one body. — main components, which we call male and female. though it’s truly neither male nor female. This is where our psychic and emotional aspect lives. This component knows that there’s only one God and that oneness is all there is. Though it can’t really explain it, it just knows the truth. So there are not a lot of problems with the female component. The problem is on the left side of the brain — the male component. — it has its logical component forward (more dominant) while the female has its logical component toward the back (less dominant). Now the grand experiment is actually the merging of spirit with biology. It is the merging of spirit with physicalness. And so those who discount their physical bodies have missed the boat. It is about the merging, the integration of spirit in the physical being. that is the part of the grand experiment. where the individuals would never get sick and only die when they were ready. It is the first time any planet or civilization has gone through the events that are happening now. They are curious to see how it will work out. will increase its frequency and vibration to allow it to shift en masse into another dimension. watching a movie or TV show, they want to see the conclusion. We are unconsciously supplying the dialogue, situations and script for the actors upon the stage of the galaxy. It is the best show there is. dimensions came in the early days before the world was contaminated by humans. This was said to be before souls became entrapped in the physicality of Earth. which would raise up and cause a union between the divine male and divine female. Now, this is the time that both will be equal. The male and female divine energies will join and this will make for a perfect being ...like Christ. Everyone here will realize they can be a perfect Christ, when these energies are in balance. The energies have not been in balance; they've been out of balance for thousands of years. That's why there are so many problems on the planet. of the God energies can unite and there will be perfection upon the planet. And this planet will be something that we can show to the rest of the worlds, the rest of the cosmos. what we have done and it has succeeded!" For "Them" it is a time of reunion and Their family coming home.